While the old adage is that the government ought to focus on guns during wartime and butter during times of peace, the Oklahoma House of Representatives tried to do both this afternoon. House members spent hours considering two controversial measures — SB 888 and SB 1212 — that mark both boxes. One bill would eliminate the refundability of wind energy tax credits while the other would allow Oklahomans to carry firearms openly without having to apply for a license. That bill, SB 888, passed 51-46. The House also advanced SB 1212, which allows people to carry firearms openly without licensure. SB 888 by Sen. Josh Brecheen (R-Coalgate) and Rep. Jeff Coody (R-Grandfield) would eliminate the refundability of wind energy tax credits beginning Jan. 1, 2019. Coody successfully tabled an amendment from Rep. David Perryman (D-Chickasha) that sought to replace the refundability language with a proposal to create a gross production tax on new wind energy projects. The Wind Coalition has routinely said there will be lawsuits filed against the state if SB 888 passes and is signed by the governor, but Coody argued Wednesday that he believes the state has solid legal standing to repeal the refundability of the wind tax credits. Rep. Leslie Osborn (R-Mustang) followed up. During debate, Rep. Forrest Bennett (D-OKC) implored Republican members of the House to reconsider their support of SB 888. Rep. Mark McBride (R-Moore) debated in favor of the bill, saying critiques of “big oil” were ironic compared to support for “big wind.” He said the companies with wind investments in Oklahoma are much larger than the state’s biggest oil and gas companies. But Rep. Carl Newton (R-Cherokee) said passage of SB 888 would jeopardize existing wind projects, which the Wind Coalition has said may default if the tax credits are no longer refundable. “We could have wind-farm graveyard tours as these turbines are falling down in people’s pastures,” Newton said sarcastically. The bill ultimately advanced after almost three hours of discussion. It would have to be heard again in the Senate before advancing to Gov. 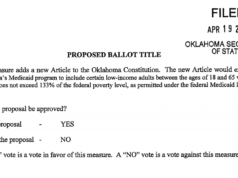 Mary Fallin for consideration, as it was amended while property of the House. SB 1212, by Sen. Nathan Dahm (R-Broken Arrow) and Rep. Sean Roberts (R-Hominy), would allow people to carry firearms in Oklahoma without being required to gain a license. SB 1212 passed 59-28 with no debate, though many questions were asked.